Now that Chase has entered the premium segment of the credit card market with its new Sapphire Reserve card, it’s time for a comparison of the premium offerings from the three primary travel rewards credit card issuers, Chase, Citi and Amex. We rank each of these cards in a variety of categories and come up with a winner. One significant item to note upfront is that Citi recently announced massive changes to the Prestige card which will be going into effect July 23, 2017. Therefore, for the Prestige card we will have current and post-change variations in our rankings as the decision points which change dramatically. All three cards carry a $450 annual fee. The Chase Sapphire Reserve card currently has a sign-up bonus of 100K Ultimate Rewards, which is the best publicly available bonus for any card on the market right now, and among the best ever. The Citi Prestige card has a bonus of 40K ThankYou Points and the Amex Platinum card has a bonus of 40K Membership Rewards. The huge bonus on the Sapphire Reserve card likely won’t last for more than a few months, but currently this card wins the sign-up bonus category in a landslide. Since the other two cards have the same number of points for their current bonuses, we will break the tie by going with the more valuable currency, which is Amex Membership Rewards over Citi ThankYou points due to Amex’s stronger network of transfer partners. The table below displays the bonus categories for earning points with each of these cards. For all categories not listed, cards earn one point per dollar. The Sapphire Reserve wins this category not only due to its strong earning rates, but also how broad Chase defines the categories. The travel category is not restricted to traditional expenses such as airline tickets or hotels, but applies more broadly to things like Uber and Airbnb. The Citi Prestige card also has very strong earnings rates and is the only card to earn bonus points on entertainment. Amex Platinum brings up the rear with no bonus categories at all. Each of these cards is part of a transferable points program that allows cardholders to transfer points to a wide variety of hotel and airline partners. Both Amex and Chase have a relationship with one of the three major domestic U.S. carriers – Amex with Delta and Chase with United. Points transfer from both programs to these carriers at a 1:1 ratio. Citi, unfortunately, has not become a full partner with American Airlines, so none of these programs transfer to Americans’ AAdvantage program. All three programs allow transfers to Singapore Airlines, which is a great carrier, but that doesn’t differentiate any of the programs. Amex and Chase have other excellent options for premium cabin international travel, namely All Nippon Airways (ANA) from Amex and Korean Air from Chase. 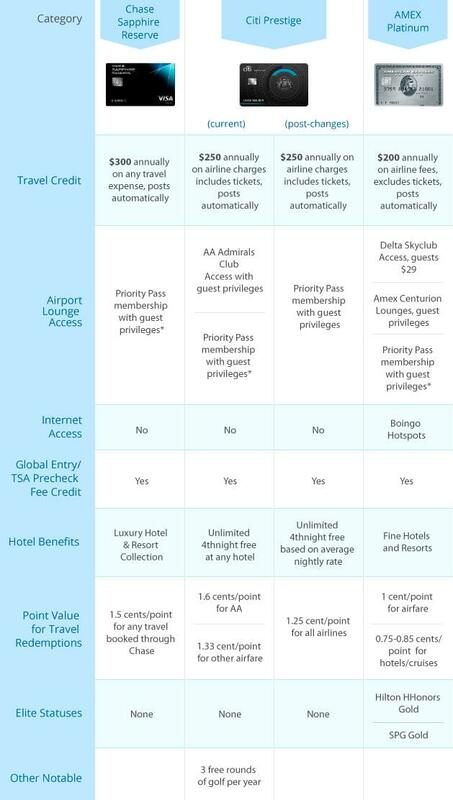 Each program also has at least one hotel transfer partner; however, the value of hotel points is far less in almost all cases than for any decent airline mile program. The one exception is Hyatt which is a Chase transfer partner. Starwood also has a valuable points program but Amex MRs transfer at a horrible 3:1 ratio, which destroys the value of transfers to SPG. While the list below is not comprehensive it summarizes the list of transfer partners to some of the most useful. Chase and Amex both have strong programs while Citi’s is a bit lacking. We give the nod to Chase due to United having a more valuable currency than Delta, Korean’s excellent first class award availability, and being the only program with a worthwhile hotel partner. In the table below we summarize the broad spectrum of other benefits offered by each of these cards. This is where we really start to see big devaluations for the Citi Prestige card after the changes go into effect. *The Sapphire Reserve user guide indicates complimentary access for travel companions. The Citi Prestige has been the king of all-around travel benefits before the devaluations were announced and the Sapphire Reserve launched. The broad-based and easy to use airline fee credit effectively reduces the annual fee to $200, which can easily be recouped for many with the three free rounds of golf or lounge access. The guest privileges for the Prestige card lounge benefits are especially generous. However, the pending loss of Admirals Club access, loss of free golf, and the devaluation of points redemptions for airfare gut the value of this card. It can still be a solid card for many, especially those with many paid hotel stays of 4+ nights, but once the changes go into effect it will not be the great card it is today. Amex is stingier with its benefits as the lounge access rules require you to pay for guests (except as its own small network of Centurion Lounges) and the airline fee credit doesn’t include airfare. Amex does have the best all-around benefits however, with two solid mid-tier hotel statuses and the Fine Hotels & Resorts program which comes with guaranteed benefits (usually worth at least $100 per stay). The Sapphire Preferred card doesn’t have quite as wide a variety of benefits, although it does have the largest and most broad-based travel credit and best point redemption values.